FILE - In this image provided by the U.S. Air Force, an unarmed Minuteman 3 intercontinental ballistic missile is launched during a May 3, 2017, test at Vandenberg Air Force Base, California. U.S. President Donald Trump, in the midst of an exchange of bellicose threats with North Korea, declared Wednesday that the United States' nuclear arsenal "is now far stronger and more powerful than ever before." In an early morning Twitter comment, Trump said that his first order as president when he took office in January "was to renovate and modernize our nuclear arsenal. "He said that "hopefully we will never have to use this power, but there will never be a time that we are not the most powerful nation in the world!" U.S. Defense Secretary Jim Mattis, in a statement Wednesday, said that North Korea "must choose to stop isolating itself and stand down its pursuit of nuclear weapons." He said the Pyongyang government "should cease any consideration of actions that would lead to the end of its regime and the destruction of its people." Trump's top diplomat, Secretary of State Rex Tillerson, however, sought to downplay the threats Pyongyang and Trump have leveled at each other in the aftermath of new U.N.sanctions imposed on North Korea last weekend. Those sanctions are aimed at cutting $1 billion of its export income and attempting to force North Korea to halt its nuclear weapons development. On a refueling layover in Guam en route back to Washington from a Southeast Asian trip, Tillerson said, "I think Americans should sleep well at night and have no concerns about this particular rhetoric of the last few days. North Korea, in a statement early Wednesday, said its armed forces were "carefully examining" a plan for missile strikes on Guam. American military bases on the U.S. Pacific island territory are believed to hold the largest U.S. arsenal of nuclear weapons outside the continental United States. But Tillerson said he never considered rerouting his jet's refueling stop. "I do not believe that there is any imminent threat, in my own view," Tillerson said. 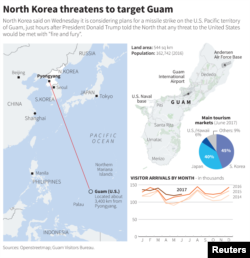 Guam Governor Eddie Calvo said there was no threat to the island, but also said in a televised speech it was "prepared for any eventuality." Calvo said "Guam is American soil...not just a military installation," and was assured by the White House that an attack on Guam would be considered an attack on the United States. Tillerson said he hopes the U.N. sanctions and the world community, including China and Russia, "can begin to persuade (North Korea) that they need to reconsider the current pathway they're on and think about engaging in a dialogue about a different future." U.S. media outlets reported Tuesday that the U.S. Defense Intelligence Agency has concluded that North Korea recently succeeded in building a miniaturized nuclear warhead, small enough to fit in the intercontinental ballistic missiles Pyongyang recently has test-fired. The North has threatened nuclear war with the United States in the past in response to United Nations sanctions over its nuclear tests.On Saturday, the U.N. Security Council voted 15-0 on new sanctions seen as an effort to cut $1 billion from Pyongyang's annual $3 billion in export income. Pyongyang has described the U.N. sanctions resolution as a "flagrant infringement" of its sovereignty. Media reports on Tuesday that referenced the DIA report said U.S. analysts have concluded that Pyongyang has now amassed 60 nuclear weapons, although some experts think the number is smaller, perhaps only half as many.